Standard preoperative instructions are followed. Discontinuation of aspirin or other anticoagulants prior to surgery is mandatory. Patients are on a clear liquid diet for two days prior to surgery and perform a gentle bowel preparation with magnesium citrate the night before surgery. Preoperative medications include antibiotic prophylaxis (first generation cephalosporin) and deep venous thrombosis prophylaxis (subcutaneous heparin 5000 U). Sequential compression devices are placed on the lower extremities. 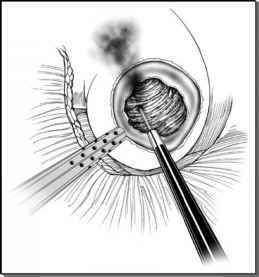 An orogastric tube that is placed is removed prior to extubation. Also, anesthesia is instructed to avoid certain inhalants as with any laparoscopic procedure and to limit fluids to less than 600 cc until the anastomosis is performed to minimize urine in the field. In our experience, when the entire team has the benefit of viewing the same three-dimensional image, the precision of the assistants' movements is greatly increased, which ultimately improves the efficiency of the entire operation.